The thermal imaging cameras of the series VarioCAM® HD head from InfraTec are based on uncooled microbolometer FPA detectors of the latest generation. 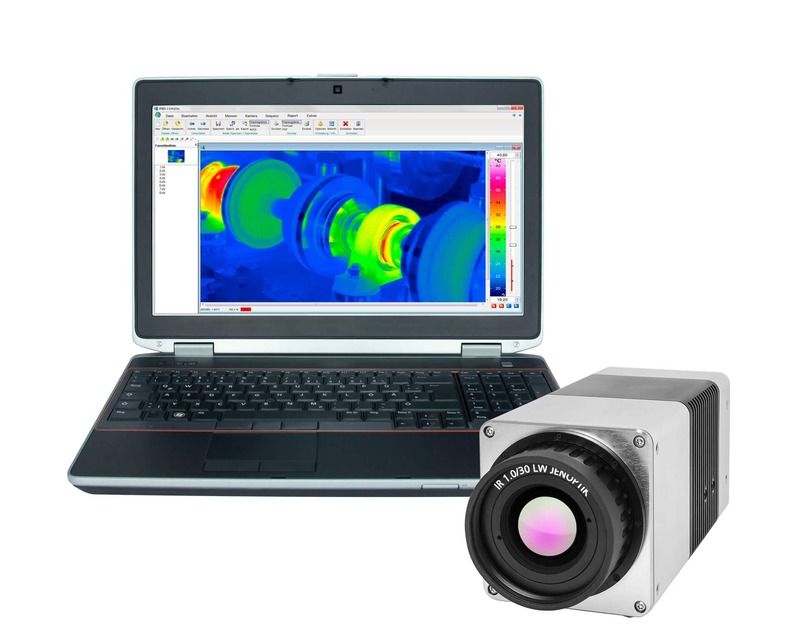 With up to (1,024 × 768) IR pixels, the largest detector in its class delivers brilliant 16-bit thermography images. Thanks to the opto-mechanical MicroScan unit, IR image formats with a geometric resolution of 3.1 MegaPixels are possible. With this technology, the thermal radiation of the measurement object strikes a rotating germanium disc and is deflected through a tumbling motion of the disc according to a precise pattern. As a result, the measurement object is depicted thermally without gap, which corresponds to a detector fill factor of 100%. The geometric resolution rises to (2,048 × 1,536) IR pixels, which represent genuine temperature measurement values. In this way, detailed thermograms that ensure exact recording and measurement of complex-structured measurement objects are created. The VarioCAM® HD head gains markedly in image sharpness and reproduction quality compared to purely software-based approaches to increasing the number of pixels, which in contrast produce only interpolated image points. Measurement errors due to geometry can reliably be avoided. In combination with an excellent thermal resolution of up to 20 mK, the thermal imaging cameras are suitable for sophisticated fixed mount stationary measurement and test tasks from production, quality assurance, process optimization, research and development as well as aerial imaging. Applications at such a high technological level are often combined with adverse environmental conditions. Therefore, belonging to the equipment of the complete series is a shock-resistant light metal housing that keeps out dust, dirt and waster, and, if desired, fulfils the requirements of degree of protection IP67. The robust design and compact housing dimensions permit problem-free installation in the rawest process environment. If the surrounding temperatures reach extremely high or low values, the correct stainless steel protective housing with optional cooling or heating provides additional protection. Moreover, a look inside shows how adaptable the VarioCAM® HD head is. With GigE Vision and GenICam, the camera series supports industry-wide standards for data transfer and image processing. As a result, each model is not only usable through the efficient and convenient thermography software IRBIS® 3 from InfraTec, but – based on these standards – also allows easy integration into existing system environments. As a result of many years of cooperation with Jenoptik, InfraTec offers a wide spectrum of high-quality optics for the VarioCAM® HD head. For example, users can record tiny structures of up to 17 µm with the single microscope objective. This optic is just as impressive as the additional super-wide angle or telescopic lenses with light intensity of f/1.0 and multiple anti-reflective coatings. In this way, the thermography system ensures a maximum of flexibility and supports a constant high measurement quality with the most varied tasks. There are innumerable possibilities to make use of these advantages. For even in their stand-alone variants, the models of the series are powerful thermography systems. The versatility of the thermal imaging cameras is shown especially in the individual assembly of a total package that is adapted to the respective measurement and test conditions on site. Besides the fast infrared precision optics, the modules and extensions of the IRBIS® 3 software family as well as excitation sources and controllers that are suitable for continuous operation round out the extensive array of accessories. This means a multitude of possible applications for the user. This ranges from active thermography to micro-thermography, aerial thermography up to object monitoring. Moreover, the VarioCAM® HD head is a central component of many key-ready automation solutions from InfraTec.